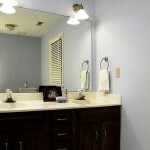 Yesterday we talked about the difference a framed mirror can make in a bathroom. Today I’m going to show you the difference it made in one of ours. 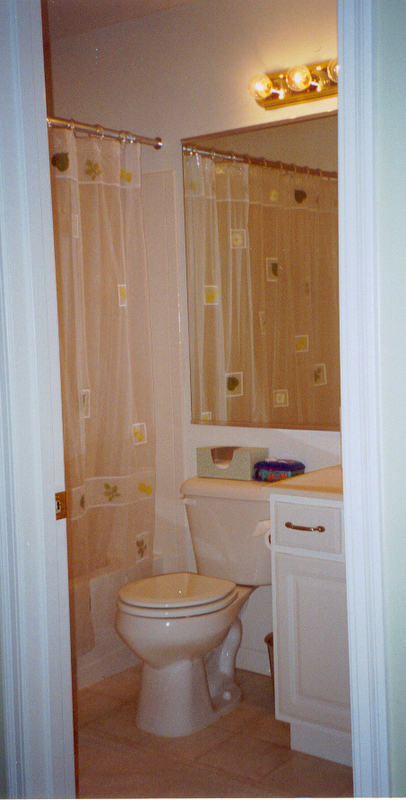 This is what my 5-year old daughter Lily’s bathroom looked like when we moved into our house in 2003 (in the days before we had a digital camera, as you can tell by the grainy picture shown above). Among the things I hated: the cheapo plate-glass mirror that ran not only behind the sink, but on across the wall above the toilet, as well. No idea what the builder was thinking with that one. To add insult to injury, they had those round “Hollywood” light bulbs in a brass vanity fixture centered over the long mirror. Everything was white and bo-ring. It looked out of date even though the house was brand new. Ta-da! What do you think? It’s a much happier little room now, that’s for sure. One of the first things we did was get that mirror out of there. That was possibly the hardest part of the makeover. My husband was determined to reuse it in the bathroom we’re going to add in the basement, so we carefully carried the mirror all the way down the two flights of stairs, cursing and sweating the whole way. But when we got to the basement, we were so relieved to have reached our destination that we let it go too quickly. One corner hit the the concrete floor so hard that the whole thing shattered. So, back up the stairs it went, out to the trash, and we braced ourselves for the inevitable 7 years of bad luck to come. The story has a happy ending, though. At least the ugly mirror was gone. Look at how much better the bathroom looks with the new one! I think it was worth all the trouble in the end. The new light fixture made a big difference, too. No more Hollywood lightbulbs! We painted the walls a color called Craftsman White, which looks remarkably yellow despite its name (you may recall my story of painting the foyer Craftsman White and being horrified to discover it was a pale yellow–this is what we did with that can of paint instead). 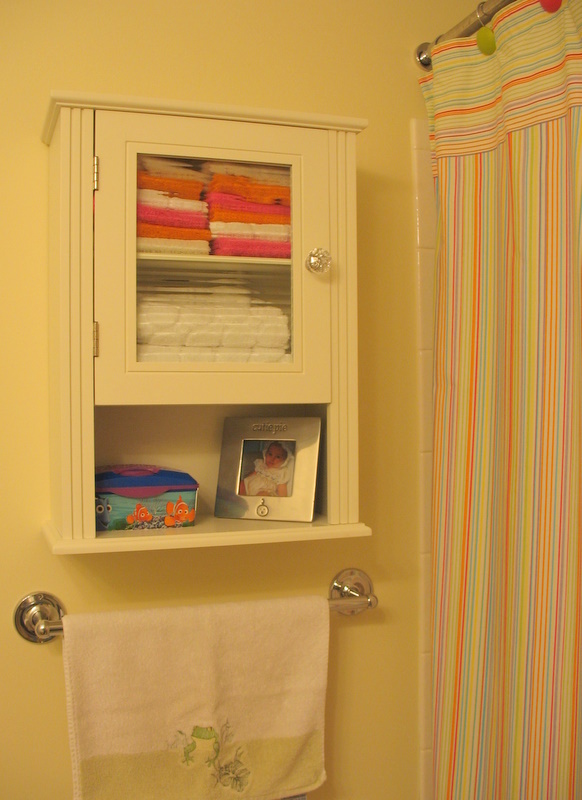 I bought this cute little storage unit at Home Goods and hung it on the wall for washcloths and handtowels. 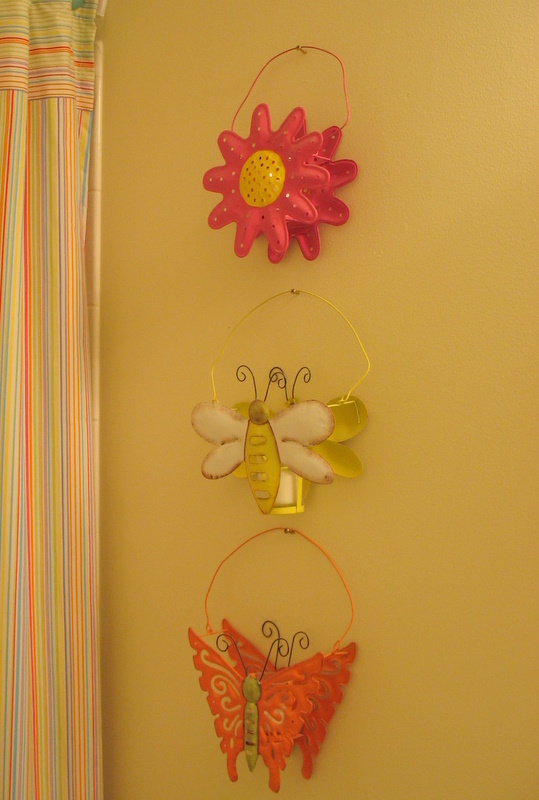 In the “garden” section of Michael’s I found these cute and colorful outdoor candle holders (there are votives inside each one), as well as the flower hook that I hung next to the sink for handtowels. They were super cheap, less than $5 each, and my daughter loves them. There’s a really bright and mod-looking rug on the floor that I forgot to take a picture of. You’ll have to use your imagination, I’m afraid. It has pink, orange, and green polkadots on a yellow background. And finally, one of my favorite changes to the room was the addition of the crown molding that Handy Dave installed (you can see it in the first “after” photo). Crown molding always makes a big difference in a room. I’m addicted to it. So what do you think? Do you like it? I hope this gives you some ideas for your own bathroom projects. 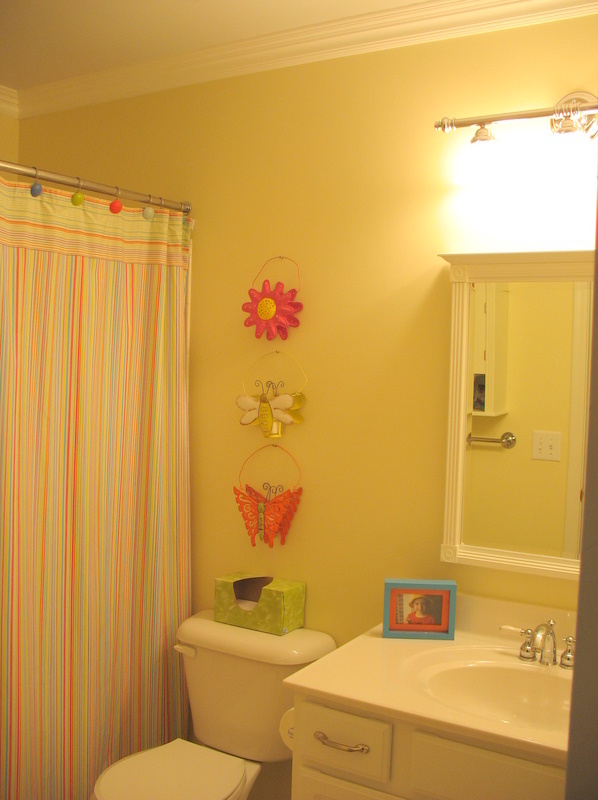 It doesn’t take much money to make a big improvement in a small space! I give you an A + + + + + + + (wink) It is so cute. What a difference a mirror and new light fixture can make! Oh, and don’t you just love Home Goods? What a lucky girl! What a cute, cheerful bathroom to wake up to. Where did you get that fun shower curtain? I wish we had a Home Goods here. Good job. Very nice job. You two made some great choices plus you found a way to use up some old paint. I love frugality! How cute is that??!! Great job! Do I like it? It’s beautiful. Looks straight out of the Pottery Barn catalog. Gorgeous! Thanks, guys! Aubrey, the shower curtain is a Wamsutta. What a great girls bathroom! I love the colors, very creative. I LOVE it! LOVE that mirror. Great bathroom makeover! Great job! It is amazing what a difference crown molding makes. I didn’t even notice the tall ceiling until I saw the crown molding. And I *love* the little votive holders- and I know my girls would too. It looks great! And that’s coming from someone who HATES yellow. 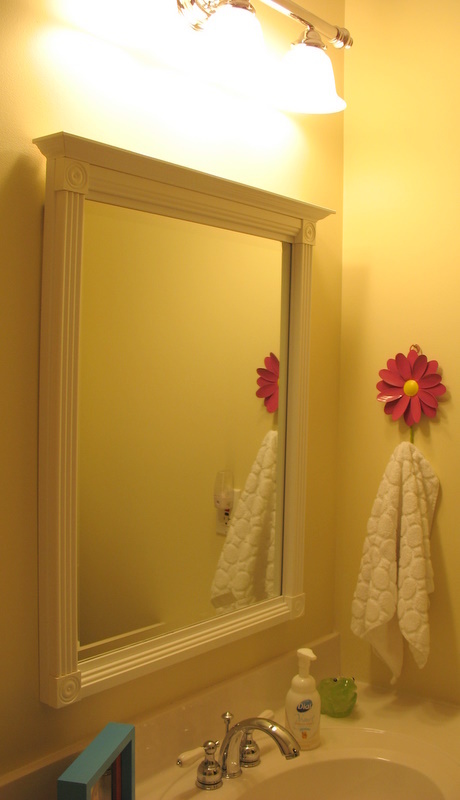 Favorite parts of this makeover: crown molding, framed mirror, storage cabinet, COLOR! I was surprised that the cabinet came from HomeGoods, ’cause I too would have sworn it was from Pottery Barn. Oh that is just adorable…fun colors and that MIRROR….did you make it??? .What a nice job Julia !!! So happy I found your blog…I just love your taste !!! Kathy–I actually found the mirror at Lowe’s, and I liked its cottage/beadboard vibe. Thought it was perfect for a little girl. It didn’t cost much, either, which I also liked! This is too cute! I love the candleholders on the wall. way to go!! Love it! Love it! Love it! You are so inspiring girl! As the only female in a sea of testosterone LOVE girlie decorations. Definitely interested in seeing the matching pink and yellow bedroom! Wow. Love it. You’ve inspired me to get rid of the Hollywood lighting in our bath. The new fixture — and the mirror — made a huge difference. What is HomeGoods? I think I need to become familiar with it. mean about the framed mirror, its not something I thought would make a difference but it did, and a huge on at that. Genius! Oooh, I’m inspired. 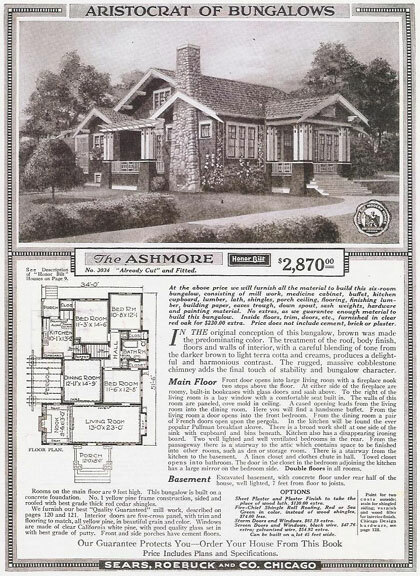 I can’t wait to start on our new place, and I’ll be visiting this site often for more inspiration! Great work! It turned out very cute. It is always so fun to see what just a little bit of money, some color and a few accessories can do to freshen a room up! The B&A are worlds apart! It looks great, definitely a bathroom I would have enjoyed as a little girl…or even now! What a sweet bathroom for your daughter! It looks so fresh and pretty..what a difference a mirror makes!! Oh how absolutely beautiful!! My daughter who is 11 would just love it. So cute … now if you’ll just come over and help me with MY Lily’s bathroom ! I LOVE it!!! Great job. I also have huge mirrors, although nothing that extends over the toliet. I’ve considered adding a frame around the existing mirror to give it a little personality. I’m too much of a scard-y cat to try and take it down like you did. You’ve made it into a light and fun space. I’m really, really enjoying your site and all the little treasures you find to post about. Thanks! I need more sleep…obviously. (9 month old teething baby lives with me) I erroniously put my friends website down on the last post instead of my own. She’s got a fun blog going too…. What a sweet little girl’s bath! It’s beautiful. I totally love this bathroom. Too cute.